Named one of Kirkus Reviews best books of 2016, Gary Schwartz's heartfelt, hilarious, pun-filled middle grade novel tells of an 11-year old's quest for love and self-acceptance in a land where psychological states are actual places. James isn't the world's greatest kid, but he's not the worst, either: he's average! When he decides to become the most average kid who ever lived, James is transported to another world where he meets Mayor Culpa, a well-dressed talking Scapegoat who recruits him to become the new King of Average. He is joined on his quest by a professional Optimist and his grouchy companion, an equally professional Pessimist. Together, they set out on a journey of self-discovery that leads them all the way from the Sea of Doubt to Mount Impossible, the highest peak in the Unattainable Mountains. There, James stumbles into a Shangri-La called Epiphany, he uncovers the secret of who he really is. Follow James on his hilarious, adventure-packed journey to find self-worth in this heartfelt middle grade novel by debut author Gary Schwartz. You of the labrynth, Alice in wonderland, etc. a great way to teach kids about emotions, states of mind, types of behaviors etc. a very fun and imaginative story for any and all ages. Really loved it. I was voluntarily provided this free review copy audiobook by the author, narrator, or publisher. Very clever way to present the information here! If you could sum up The King of Average in three words, what would they be? No extreme reaction but it did make me think, laugh a little and sometimes even shake my head at some of the characters. I love psychology so I found this book to be wonderful. It was written in a way that teaches about behaviors and personalities but also makes it fun to listen to. Not only is this a well written book but his narration is excellent. I would recommend this book to anyone who is considering it as I am very happy I was given the opportunity to listen to it. I was voluntarily provided this free review copy audiobook by the author, narrator, or publisher. such a good book! good for all ages! This book was awesome. It's extremely whimsical. This is the first time i've heard a book from this writer, and I loved it. Its so imaginative and so very creative. I fell in love with all of the characters. I think everyone of all ages would enjoy this book. If this had not been a review book I would hsve DNFed. This book was so ridiculous at first I thought it was an Adult Fiction parody mash-up of Baum, Lewis, and Jeff Kinney; but it is not. The writing is poor and the content will be of very little interest to Middle Grade aged readers, if at all. Initially I wasn't too sure about the book... However, once I got into the story a bit more, I found myself really enjoying it! The author is so creative with his use of words and phrases. He turns ordinary phrases into a beautiful setting. Like Alice's trip through Wonderland or Dorothy's trip to Oz, this book keeps you guessing. The author creates such a fun story and you really grow to enjoy the characters! This book is very family friendly. I would recommend it for all ages. The narration is very well done. Overall I would give this book a solid 4 stars! Listen to it all the way through because if you don't you will regret it! What about Gary Schwartz’s performance did you like? Would you listen to The King of Average again? Why? I would probably listen to this again with my nieces and nephews, who would probably enjoy it. It is well performed and the ideas are very clever. It would be fun to hear their thoughts and discuss the story with someone in the target audience, to see how it comes across to them. I really enjoyed the various voices used for the characters. Sometimes in audio this can either be over the top or lacking, but here I think it was just about right. There were some characters with very distinct voices (because of accents) and they were handled really well. This book and the narration were excellent. It was a Wizard of OZ type story with talking animals and odd characters. At first I thought that maybe my young teen grandson would enjoy it but I believe that he wouldn't catch all the play on words that is a big part of the books world. I think it will be best appreciated by adults or very bright, well read youngsters. I can’t praise this book enough. It is a sweet and witty middle grade novel, that both kids and adults (hey, I am an adult!) would love, and I highly recommend you pick the audiobook version. Those six hours flew by very quickly. 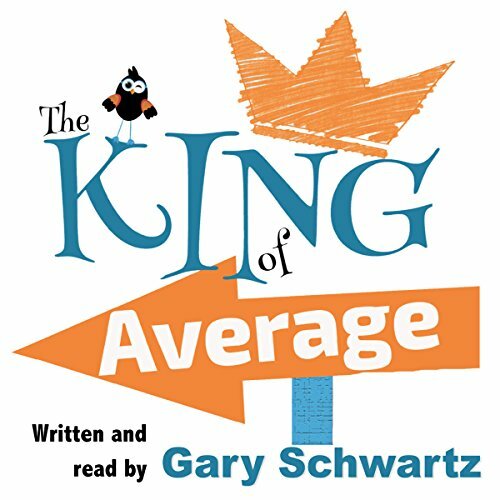 What was one of the most memorable moments of The King of Average? Imaginary world and word play for both the places and the names of characters. Loveable characters and curious adventures - what more can you ask for! When Monsieur Roget was introduced. He is my favourite! The Realm of Possibilities for the most average kid ever! I believe that any reader will be able to find a character they can relate to in this book. This audiobook brought up the long forgotten feeling of a childhood story well-told - something that I often find missing in contemporary middle grade fiction. I think that the fact that Gary is a professional voice actor, undoubtedly, adds to the story. His narration is so perfect, I kept forgetting that I was listening to one person doing all of those voices. A middle-grade adventure story with some clever word-plays. This is going to be a difficult review to write as I'm not quite sure how I feel about this audiobook. It was a middle-grade adventure story with a large number of word-plays and puns, that seemed to be more directed at adult readers; yet the adventure itself was more suited for a younger audience. The audio version was expertly read by the actor, turned author, Gary Schwartz. James is an average kid, with a mother who is too busy to give him any time and who claims he should never have been born. Not surprising then, that he has identity issues and a lack of confidence. He decides he must be the most average boy alive - average in school, in sports and in all other areas of his life, in fact, he could be the King of Average. via The Sea of Doubt to Mount Impossible, the highest peak in the Unattainable Mountains. This is a strongly moral story, but how many children are going to stop to think about the book's message once the narrative ends? In my opinion, the target audience is teachers who are looking for a book to read aloud to their class, that also has some interest for them by way of the word plays and puns. My thanks to Gary Schwartz, Audiobook Boom and Audible, who gave me this audiobook in exchange for an honest review. It has so many layers to it, Excellent for both adults and children alike. How it creates hope, adventure, family and friendship, with cleverly explaining things like what an optimist, a kill joy or a scape goat is and how they got to be like that. When the little boy chose his love for his mother over his new pals. There are many moving parts to this tale.